PALA MESA — Firefighters battling the Lilac Fire that tore across more than 4,100 acres near Fallbrook and destroyed at least 65 structures switched from a defensive approach to an offensive attack this morning, authorities said. Read more here. 9 p.m. DEC 7 | A fast-moving wildfire that started near Bonsall has now consumed more than 4,100 acres, destroyed dozens of homes and is threatening thousands of homes in Fallbrook and Oceanside, injuring three people, closing roads and forcing widespread evacuations. The Lilac fire, which started about 11:15 a.m. just west of Interstate 15 and north of Lilac Road in Pala Mesa, ripped through the Rancho Monserate Country Club and destroyed dozens of mobile homes before starting on its swift path west toward Oceanside and north towards fallbrook. As of the time of this update, Cal Fire officials said the fire is zero-percent contained and is moving faster than resources can be brought in. Fire officials said at 9:11 p.m. that the fire has destroyed 20 structures and damaged 12 others. Residents in several areas of Oceanside, Fallbrook and Vista are under mandatory evacuation orders, and officials announced an evacuation warning for the area south of North River Road, west of East Vista Way, north of Bobier Drive and east of Melrose Drive and North Santa Fe Avenue. With large swaths of dried brush in the path of the blaze, fire officials said the fire could potentially reach the Pacific Ocean if the weather conditions continue to be unfavorable. “They have grown quite a bit,” Cal Fire Capt. Jon Heggie said to 10 News about the evacuation zones. Oceanside High School is taking in evacuees at 1 Pirates Cove Way, Oceanside, 92054, and the City of Carlsbad has a shelter open at the Stagecoach Community Center at 3420 Camino de los Coches, Carlsbad, 92009. Schools and colleges across North County have cancelled classes and athletic events tomorrow. 6:57 p.m. DEC. 7 | A fast-moving wildfire tore across thousands of acres near Fallbrook today, gutting dozens of homes while threatening hundreds of others, injuring several people, closing roads and forcing widespread evacuations. The wind-driven blaze erupted for unknown reasons about 11:15 a.m. just west of Interstate 15 and north of Lilac Road in Pala Mesa amid gusty, arid weather. Within an hour, the burn area had grown to about 50 acres as ground and airborne crews labored to keep the blaze, dubbed the Lilac Fire, from becoming a disastrously out-of-control conflagration like others raging this week across Southern California. By 2 p.m., the flames had spread over roughly 500 acres, were threatening an estimated 1,000 homes and had sent a thick pall of brown smoke to the southwest above the North County and out over the ocean, according to Cal Fire. As of late afternoon, crews had gained no containment of the fire, which had grown to about 2,500 acres while being pushed by stiff Santa Ana winds “at a dangerous rate of spread,” Cal Fire reported. Two residents were taken to a hospital for treatment of burns suffered during the blaze. The severity of their injuries was unclear. Many of the structures lost to the flames were residences in a mobile- home retirement community near the origin point of the blaze, officials said. Television news helicopter footage showed rows of dwelling units at Rancho Monserate Country Club engulfed in fire or already reduced to smoldering rubble. During a late-afternoon news conference, authorities urged residents of communities near the site of the blaze — and across the San Diego region — to remain vigilant in the face of ongoing threats of wildfire amid the dicey and unseasonable weather conditions gripping the area. Sheriff Bill Gore called on the public to “stay alert” and keep close tabs on the blaze via news accounts and local-government bulletins issued online. San Diego County was quick to proclaim a state of local emergency due to the blaze. The decree, issued in the mid-afternoon, will help make the region eligible for state and federal resources. Later in the afternoon, Gov. Jerry Brown issued a state emergency proclamation for San Diego County. Authorities issued a mandatory evacuation order for all areas south of SR-76, west of I-15, north of Gopher Canyon Road and east of Mission Road/Vista Way. Among the evacuated sites were Bonsall High School, Sullivan Middle School and all neighborhoods along West Lilac Road. In the early evening, the county issued a new evacuation order for the region south of Burma Road, east of Wilshire Road, north of North River Road and west of South Mission Avenue. Additional orders were then isued for the area south of Reche Road, west of the 15 Freeway, east of Green Canyon and South Mission Road and north of Highway 76. Authorities set up evacuation centers for the displaced at East Valley Community Center in Escondido, Fallbrook High School and Pala Casino. People with horses and livestock were advised to take their animals to shelter at the Del Mar Fairgrounds. The California Highway Patrol closed down SR-76 from Gird Road to Old Highway 395 and blocked off the latter route between West Lilac Road and SR-76. A contingent of about 700 firefighters from various area agencies was working to control the blaze as of late this afternoon, Cal Fire Deputy Chief Dave Nissen said. On Friday morning, Navy and Marine Corps aircraft areexpected to join the other firefighting helicopters and air tankers assigned tothe fire, he told news crews. Overnight, aircraft from the city of San Diego and Kern County willcontinue to conduct water drops, according to Nissen. About 70 sheriff’s deputies were working in the fire-ravaged area,handling road closures and providing security for evacuated homes, Gore told reporters. Campuses in 10 school districts in northern and eastern San Diego County will be closed Friday due to the out-of-control wildfire, high winds and potential power outages, officials said. Some are potentially in the path of the fire. The cause of the blaze — which broke out amid a National Weather Service “red flag” wildfire warning slated to expire Sunday night — was not immediately clear. Two civilians are now being treated for burns suffered in the swift-moving Lilac Fire near Bonsall that has now charred 2,500 acres and has destroyed 20 structures, damaged dozens of others and is threatening 1,000 more homes, harkening back memories of the devastating fires in Fallbrook 1o years ago. Cal Fire Capt. Jon Heggie told 10 News at 3:40 p.m. that the fire has now quadrupled from its previous 500-acre size, with zero containment. Cal Fire San Diego also reported at 3:25 p.m. that two civilian burn victims were in the process of being treated and transported to area hospitals. The incident started off of South Interstate 15, and is being blown away from the 15 freeway toward Sullivan Middle School and State Route 76. The North County Fire Protection District has expanded its mandatory evacuation for the areas north of Bobier Drive, south of North River Road, west of East Vista Way and east of Melrose Drive and North Santa Fe Avenue. Highway 76 has also been closed in both directions. San Diego County around 2:15 p.m. declared an emergency, which will help make the region eligible for federal and state resources. The blaze has destroyed at least two mobile homes and damaged 12 others in the Rancho Monserate Country Club, a senior-citizen mobile home park just west of Interstate 15, North County Fire spokesman John Buchanan said. The San Diego Sheriff’s Department is handling the evacuation. Evacuation centers have been set up at Fallbrook High School and Great Oak High School in Temecula and The Forum in Carlsbad. People with livestock can bring their animals to the Del Mar Fairgrounds, which is opening up to accept them, according to Cal Fire. The fire breaks out as red-flag and high-wind warnings have gripped the region, as low humidity, strong Santa Ana conditions and seasonally warm temperatures have combined to create a wildfire threat not seen since 2007, when several wildfires charred hundreds of thousands of acres across the county. During the 2007 incident, the Rice fire swept through and destroyed most of the Valley Oaks Mobile Home Park in Fallbrook. 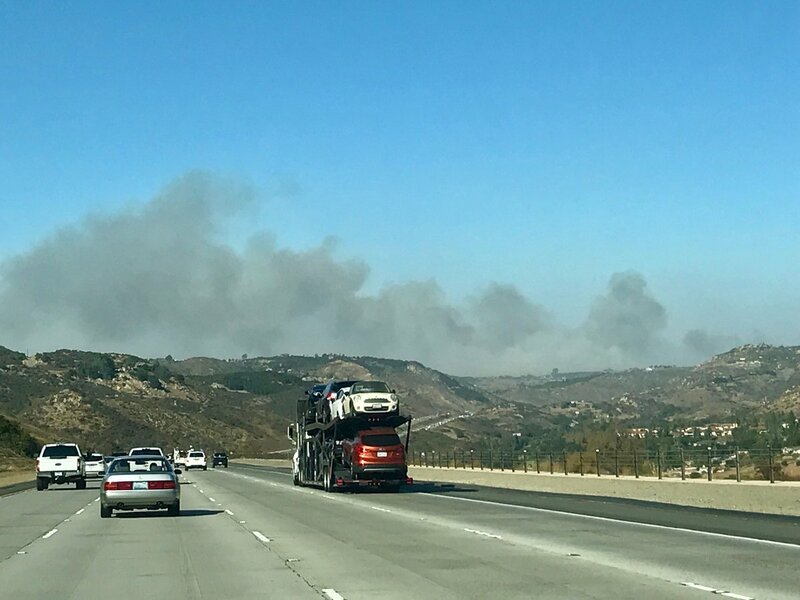 Smoke can be seen from as far away as San Marcos, Oceanside, Encinitas, Carlsbad and Escondido, prompting officials in those cities to issue a statement to residents that the fire doesn’t pose a threat to those cities. Cal State San Marcos announced Thursday that the campus was closed effective 3:30 p.m. and would remain closed Friday as a precaution. “Currently, no fires are threatening the vicinity of the University. The closure is precautionary and in consideration of students, faculty and staff who live in or must travel through areas impacted by the fires,” Cal State San Marcos spokesman Eric Breier wrote in a news release. Carlsbad Unified School District announced that all sporting events Thursday would be cancelled due to poor air quality. MiraCosta College just announced that classes at the Oceanside Campus and Community Learning Center were also cancelled due to the fires. The San Elijo Campus in Encinitas remains open. This is a developing story and The Coast News will provide updates as they are released.